This week on the Bake Off it was Tudor week. 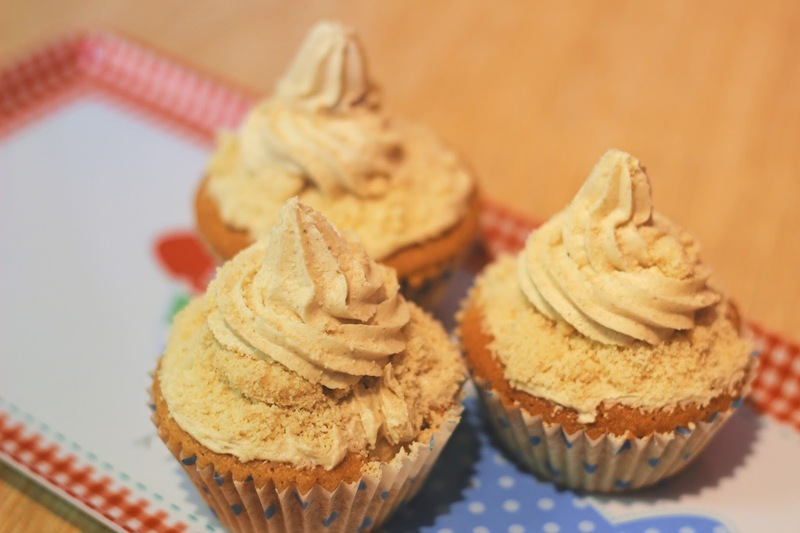 I didn’t think anyone would really fancy eating anything they made on there and I’d read the Tudors liked the eat a lot of spice and fruit, so I went for these autumnal Apple Crumble cupcakes that Zoe made in one of her recent videos, which looks perfectly autumnal! The blog post for them is also here. They look really good so I thought they would be enjoyed! 1. Preheat the oven to Gas Mark 3/170C. 2. Peel the apples, core them and chop them into little squares. Put into a large saucepan, cover them in water and simmer for 5-7 until softer. Leave them to cool. I used three Golden Delicious apples, but I found I didn’t need all of the squares. 3. Cream the butter and sugar together until light and fluffy. 4. Add the eggs and vanilla extract until combined. 5. Add the flour, baking powder, cinnamon, salt and mix until combined. 6. Add the apple (as much as you need) to the mixture and stir in with a wooden spoon. 7. Put cupcake cases in a bun tin and fill. Bake them in the middle of the oven for 15-20 minutes, until a skewer comes out clean and they are lightly golden. 8. Put the flour, cinnamon, butter and vanilla extract in a bowl. Use your hands to make a breadcrumb consistency. 9. Pour in sugar and mix in with a spoon. Pop on a baking tray lined with paper and put in the oven for 5-10 minutes until light golden. 10. Beat the butter and brown sugar, cinnamon and vanilla together for 5-7 minutes, until light and fluffy. 11. Add icing sugar to the butter mixture a little at a time. Add milk until the buttercream has reached the right consistency. 12. 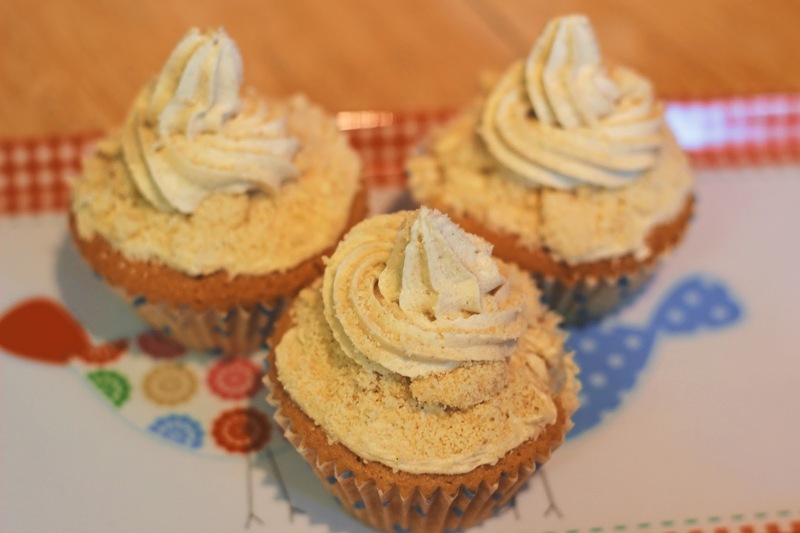 Put a small amount of buttercream on top, then add some crumble. Pipe the buttercream on top with a star nozzle. 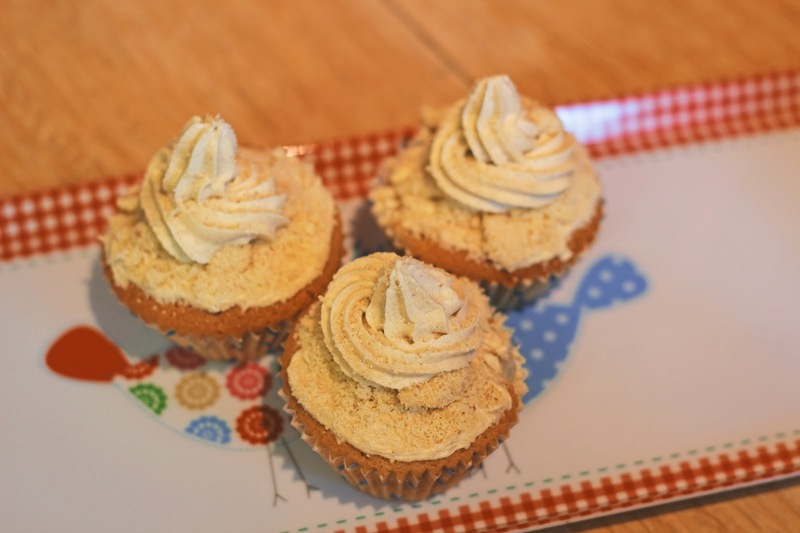 Have you tried making these?